Ecstasy, also known as MDMA or “Molly,” is a very popular psychoactive or recreational drug. Due to effects such as euphoria, energy buzz, increased alert and empathy coupled with increased potency it has led to more public dialogue and awareness. About 12.4 million Americans aged 12 or older have tried Ecstasy at least once in their lifetime. You might have seen people make grotesque faces at the club (“gurning” as it’s called in the UK), or dance wildly for hours and have endless energy. Ecstasy can however also cause trismus, also known as lockjaw, or the decreased ability to open your mouth. It is caused by a spasm of masticatory muscles and it can be a painful experience. What are the Adverse Effects of Ecstasy? As young party-going adults know, jaw clenching or “bruxing,” is one of the most frequent and unpleasant aspects of taking Ecstasy–and usually the cause of gurning. Bruxism generally affects people when they’re sleeping, and in 70 percent of cases can be attributed to increased stress or anxiety. However, bruxism can also be a result of higher serotonin release, as well as the release of dopamine and noradrenalin. While the most common symptom is the grinding of teeth, the worst cases can also lead to premature tooth loss. Bruxing can, at worst, result in premature tooth loss. Besides teeth clenching and excessive wear on teeth, there are other concerns such as prolonged dry mouth due to reduced saliva production. Combined with bruxism (which can last for up to 24 hours after taking the drug), dehydration from wild, tireless dancing, and the possible consumption of acidic and sugary drinks like orange juice, MDMA can cause a number of damaging effects on your teeth, such as enamel erosion, excessive wear, tooth decay, teeth sensitivity, jaw soreness and tenderness of the temporomandibular joint (TMJ). All above symptoms listed can affect your bite, which can in turn result in uneven wear of the enamel. So how do you self-regulate clenching or bruxing? One thing to watch for is dosage. 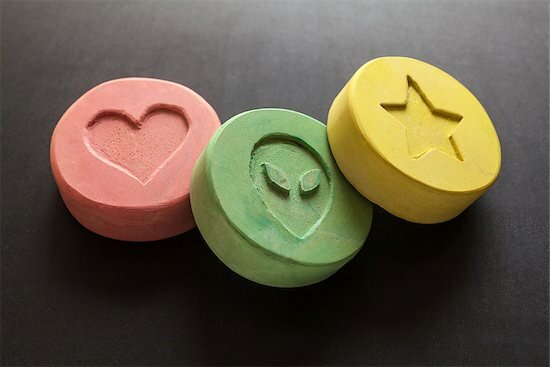 Data from 2014 suggested the average ecstasy pill had 108mg of MDMA, compared to the 80mg average of the early 90s. Effects are likely dose-related; higher dose tablets might be more likely to lead to side effects like bruxing, as will repeated dosing of lower strength tablets. Of course, abstaining from ecstasy is another safeguard against tooth damage associated with the drug. That said, if you choose to use stay hydrated and avoid acidic drinks. Bring your sugar-free gum, and try to rinse and brush with higher fluoridated products (tooth paste, gel or rinse) before you go to sleep at 6 a.m.
At PreserveYourTeeth Dentistry® we focus on developing a customized protocol that guides each patient to prevent further damage.